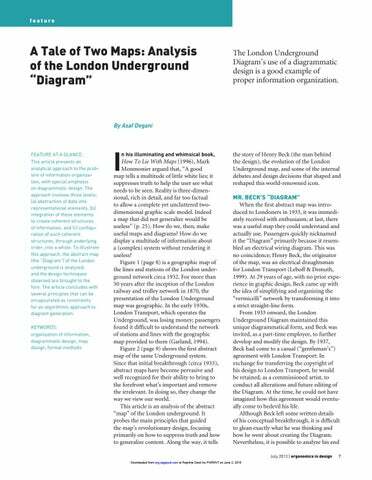 The London Underground Diagram’s use of a diagrammatic design is a good example of proper information organization. Figure 1. Geographic map of the London Underground railway network, circa 1932. Copyright TfL from the London Transport Museum collection. Reprinted with permission. Figure 2. Diagrammatic map of the London Underground railway network, circa 1933. On the right is a scaled comparison of the two maps. Copyright TfL from the London Transport Museum collection. Reprinted with permission. Figure 4. Four solutions to the “Aldgate Triangle” complex, circa 1965. From Mr. Beck’s Underground Map (p. 69), by K. Garland, 1994, Harrow Weald, UK: Capital Transport. Copyright 1994 by Capital Transport. Reproduced with permission of the publisher. Figure 5. The 1949 Diagram showing a rectangular overall pattern. The Circle Line (yellow), which engulfs the central area, is shaped like a water flask. Reprinted with permission of the Transport for London Company. Figure 6. Deformation map showing the correspondence between Beck’s abstract map of 1933 (Figure 2) and Stingemore’s quasi-geographical map of 1932 (Figure 1). The joint reference points are Charing Cross and Hammersmith station. Figure 7. The underlying grid and Piet Mondrian’s painting Composition With Yellow, Blue, and Red 1937–42. Copyright 2013 Mondrian/Holtzman Trust c/o HCR International USA. Figure 8. The network with the new Victoria Line as submitted to London Transport (circa 1961). Adapted from Mr. Beck’s Underground Map (p. 54), by K. Garland, 1994, Harrow Weald, UK: Capital Transport. Copyright 1994 by Capital Transport. Reproduced with permission. A Tale of Two Maps: Analysis of the London Underground â&#x20AC;&#x153;Diagramâ&#x20AC;? Figure 9. The current (2012) Diagram. Copyright 2012 by the Transport for London Company. Reprinted with permission. solutions that satisfy the aforementioned design constraints. One possible approach is a linear programming solution. The second challenge is to come up with a formal solution for integration. In many respects, this problem is more artistic and less formally tractable than the abstraction and configuration problems. There are two aspects to integration: The first concerns the multiplicity of features of and interrelations among the elements to be integrated; the second is the arrangement of these interrelations so as to achieve a visually coherent and effective set (note the different solutions proposed by Beck for the Aldgate triangle in Figure 7). A possible clue to developing a proper representation and computation of the integration problem is the observation that different elements (e.g., stations) have one or more properties of a specified list (e.g., line connectivity, pedestrian passages, geographic orientation, proximity) and thus possess pairwise interrelation, of varying degree, with all other elements. Accordingly, stations can be clustered with other stations in sets based on shared properties and the degree of affinity between each station pair. As such, each station may belong to a number of clusters that represent different sets of properties and relations. These clusters form the basis for generating the set of possible integration solutions. One possible formal approach to the representation of relations and creating appropriate clusters is graph theory. (See Shmueli et al., in press, for the application of the approach to automotive systems.) Beyond the design of transportation maps and diagrams for tourist maps and museums, what is the utility of such principles and formal techniques? Two main avenues come to mind: First, given that any human interaction with technology can be represented as a network (e.g., automotive climate control system, aircraft fuel system, medical devices), it is possible to apply these principles and techniques to the design of their (always abstract) interfaces. Second, there is a developing trend toward dynamic and adaptive interfaces that are tailored to users’ specific needs and that reconfigure themselves accordingly. Such reconfigurable interfaces require computational methods and suitable algorithms for their generation. References Alexander, C., Ishikawa, S., & Silverstein, M. (1977). A pattern language. New York, NY: Oxford University Press. Alexander, C. (2002a). The phenomenon of life. Berkeley, CA: Center for Environmental Structure. Alexander, C. (2002b). The process of creating life. Berkeley, CA: Center for Environmental Structure. Barshi, I., Degani, A., Iverson, D., & Lu, P. J. (2012). Using medieval architecture as inspiration for display design: Parameter interrelationships and organizational structure. In Proceedings of the Human Factors and Ergonomics Society 56th Annual Meeting (pp. 1799–1803). Santa Monica, CA: Human Factors and Ergonomics Society. Bennett, K., & Flach, J. (2011). Display and interface design: Subtle science, exact art. Boca Raton, FL: CRC Press. Degani, A., Barshi, I., & Shafto, M. (in press). Information Organization in the Airline Cockpit: Lessons from Flight 236. Journal of Cognitive Engineering and Decision-Making. Santa Monica, CA: Human Factors and Ergonomics Society. Degani, A., Jorgensen, C., Shafto, M., & Olson, L. (2009). On organization of information: Approach and early work (NASA Technical Memorandum No. 215368). Moffett Field, CA: NASA Ames. Garland, K. (1994). Mr. Beck’s Underground map. Harrow Weald, UK: Capital Transport. Jenny B. (2006). Geometric distortion of schematic network maps. Bulletin of the Society of Cartographers, 40, 15–18. Jung, C. G. (1955/1972). Mandala symbolism. Princeton, NJ: Princeton University Press. Leboff, D., & Demuth, T. (1999). No need to ask: Early maps of the London Underground railways. Harrow Weald, UK: Capital Transport. Monmonier, M. (1996). How to lie with maps. Chicago, IL: University of Chicago Press, Rawsthorn, A. (2012, August 5). The subway map that rattled New Yorkers. New York Times. http://www.nytimes.com/2012/08/06/arts/design/ the-subway-map-that-rattled-new-yorkers.html?_r=0 Shmueli, Y., Degani, A., Zelman, A., Asherov, R., Zande, D., Weiss, J., & Bernard, A. (in press). Toward a Formal Approach to Information Integration: Evaluation of an Automotive Instrument Display. Proceedings of the 2013 International Annual Meeting of the Human Factors and Ergonomics Society Woodcock, J., & Davies, J. (1996). Using Z: Specification, refinement, and proof. London, UK: Prentice Hall. Asaf Degani is a research scientist at GM’s Advanced Technical Center, Israel. His current research is on formal methods of information organization for the design of automotive systems. Prior to joining GM, he worked for NASA Ames for 20 years, where he conducted research in aviation safety, cockpit design, and human-automation interaction. He received his PhD in industrial and systems engineering from Georgia Institute of Technology, Atlanta.